Alternative Learning Materials for Alternative Learning Styles Satisfy your hard-to-meet curriculum needs for students who don't easily fit into a regular school program or who have special learning difficulties. 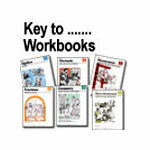 Key to... workbooks offer a positive alternative to large, expensive textbooks, which students often find complicated and intimidating. Only one concept is presented per page, so students have time to understand new ideas without being overwhelmed. Handwritten examples and exercises make work seem less intimidating. The vocabulary and reading level are simple. Instructions are clear and direct, so students can work alone or in small groups, giving you more time with those who need extra help. Save Your Valuable Time Each book is a complete text/workbook. You don't have to prepare lessons, duplicate pages of problems, or make answer keys or problems sets. Answer books provide actual reproductions of each workbook page and show every solution step by step. Support materials also include helpful suggestions for using the workbooks with your class, class progress charts, and reproducible diagnostic and final tests. Stretch Your Budget with Affordable Prices The extremely low price of these workbooks means each student can have his or her own personal workbook, encouraging pride of ownership. Also, whenever necessary, you can replace a lost workbook for a small fraction of the price of buying a new textbook. Key to Geometry offers a non-intimidating way to prepare students for formal geometry as they do step-by-step constructions. CLICK ON PICTURE FOR FULL DETAILS AND PRICES. Students using Key to Measurement enjoy a variety of hands-on experiences related to the English system of measurement. CLICK ON PICTURE FOR FULL DETAILS AND PRICES. With these workbooks, students learn how to measure in metric units. CLICK ON PICTURE FOR FULL DETAILS AND PRICES. Key to Percents first emphasizes mental computation and estimation skills because most work with percents is done without pencil and paper. CLICK ON PICTURE FOR FULL DETAILS AND PRICES. Key to Algebra offers a unique, proven way to introduce algebra to your students. CLICK ON PICTURE FOR FULL DETAILS AND PRICES. Key to Decimals begins with basic concepts and operations on decimals. CLICK ON PICTURE FOR FULL DETAILS AND PRICES. Do you have students who have never mastered fraction concepts or who need a good review?. CLICK ON PICTURE FOR FULL DETAILS AND PRICES.